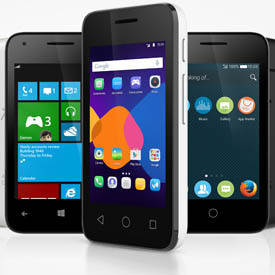 Alcatel Onetouch, one of the world’s fastest-growing smartphone brands, announces the UK release of the smallest smartphone in the third generation of its PIXI family, the PIXI 3 (3.5). The petite entry level smartphone features a 3.5-inch display. . Ideal for the first time smartphone user, the PIXI 3 (3.5) runs on the easy to use Android Kitkat operating system and features a 2 megapixel camera. Pre-loaded with popular apps such as Facebook, WhatsApp, Twitter and graphic filters plus photo editors the PIXI 3 (3.5) is ready to go straight out of the box. The compact PIXI 3 (3.5) offers a dual core processor and 3G internet access, with a micro SD card slot, to enable up to 32MB of storage. The PIXI 3 (3.5) also permits its principal user to enable Guest Mode, to protect user privacy in certain applications, photos and videos. The PIXI 3 (3.5) is available in White from Sainsbury’s stores nationwide and the phoneshopbysainsburys.co.uk website.